Published: Dec. 17, 2017 at 10:33 p.m.
Oakland Raider cornerback Sean Smith picks off Dallas Cowboys quarterback Dak Prescott's pass. Published: Dec. 17, 2017 at 08:47 p.m.
Oakland Raiders cornerback Sean Smith picks off Dallas Cowboys quarterback Dak Prescott's pass intended for wide receiver Dez Bryant. Published: Oct. 9, 2016 at 05:00 p.m.
Oakland Raiders cornerback Sean Smith intercepts San Diego Chargers QB Philip Rivers on a deep pass. 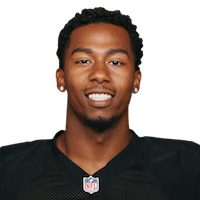 Published: Sept. 25, 2016 at 03:27 p.m.
Tennessee Titans QB Marcus Mariota intercepted by Oakland Raiders cornerback Sean Smith, who wrestled the ball away from Rishard Matthews.